Thank you for your interest in joining the community of practice, we are currently accepting applications for the third wave of the programme. Under the primary care home model, a complete care community is formed – drawn from GP practices, community, mental health and acute trusts, social care and the voluntary sector – to focus on local population needs and provide care closer to home. Aspirant primary care home sites should complete the application form below and send it by email to: pch@napc.co.uk. Please note, all applications need the formal support of the local clinical commissioning group. If you would like to have a discussion about joining the programme or have any questions, please contact the NAPC office on 020 7636 7228 or email pch@napc.co.uk. Please complete all sections of this application. If you’re applying for more than one PCH site to join the PCH community of practice, please ensure the information requested is provided for each PCH. Please include the name, role title, telephone number and email address of a single person who we can contact and is best able to field queries about the application FOR EACH of the PCH sites your application relates to. Q6. Please provide written confirmation that the development of the PCH model and its characteristics has formal support from your CCG. Please upload any written confirmation from your CCG. Q7. 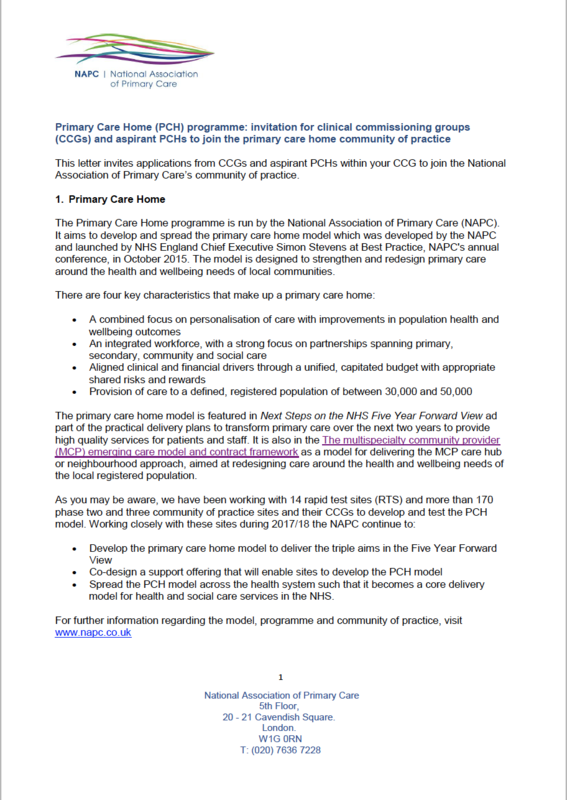 Please provide written confirmation that there is a shared commitment from your local primary care (including GP practices), community care, secondary care, mental health, Director of Public Health, social care/local authority, and voluntary sector providers to support the development of your PCH model. Please describe what organisation/network/system plans have been agreed. Please describe what plans have been agreed or attach a copy below. Upload your Operating Plan or Sustainability and Transformation Plan (STP) to March 2021 if relevant (see previous question). Please describe what financial support has been identified. Q12. If applicable, please outline what progress has already been made in developing the PCH model locally? This includes (for example): Building relationships that enable all sites across the health system wishing to develop the PCH model to learn from the rapid test sites, the PCH programme and other members of the community of practice; Engaging aspirant PCH sites in joint activities and discussions with the PCH programme and other members of the community of practice, to share information and help each other in the development of the PCH model; Developing a shared repertoire of resources/practice to develop and evaluate the PCH: experiences, stories, tools, ways of addressing recurring problems.